GFCI circuits are electrical devices that protect people from electrical shock injury and electrocution. GFCI stands for Ground Fault Circuit Interrupter. These special circuits continually monitor the electricity flowing through the circuit. If the GFCI detects any change in the current, it immediately switches the power off to that circuit. There are three types of GFCI protection: GFCI circuit breakers, portable GFCI units and GFCI receptacles. GFCI breakers and receptacles are capable of protecting multiple outlets. Go to the kitchen, bathroom, garage, crawl spaces, unfinished basement and outdoor outlets and plug in the outlet tester. Verify all GFCI-type outlets in your home are working properly. The tester will illuminate a green light if working correctly. Make note of any that are not working. Locate the breaker box. Look for breakers that have a red reset button on them. Read the panel label to determine what area of the home is protected by that circuit. Turn off the breakers one at a time. Start at the area described on the panel label and plug in the tester. Go to the other areas listed in step one and repeat the process. If you do not get a power reading on the tester, the outlet is protected by that particular GFCI circuit breaker. Make a note of each one and repeat the process through each of the breakers. 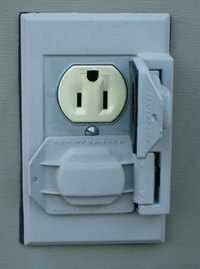 Search for any GFCI outlets. They are distinguished by having a red reset button and a black test button on them. Push the black test button in with your finger. If the red button pops out, press the red reset button back in place. The outlet is working properly. Press the test button to deactivate any outlets loading off the GFCI unit. Plug the tester in the outlets described in the areas listed in step one to find those that are protected from that particular plug. Reset the GFCI and repeat the process with all other GFCI receptacles.